Not all companies require their male employees to sport the suit and tie look, especially if their job necessitates that they dress for functionality and comfort. While the traditional corporate look is not required, this does not mean that employees can't look professional day in and day out. To maintain a professional look and a certain level of comfort and functionality, business casual is the way to go. Custom company shirts can help your employees evoke a smart and uniform look while making it easy to move and go about their jobs. Company Polo shirts with your logo embroidered are the perfect way to show appreciation to both employees and clients. Our faithful logo reproduction and wide variety of cotton/cotton blends make this category one of our most popular. Most of our polo shirts have a women's coordinating style. 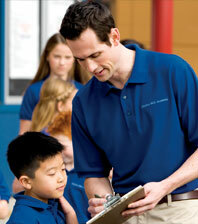 Polos work great for Embroidered Company Shirts. We offer many options such as 100% cotton, blends, 100% polyester, and many different styles and colors. We know we can find the right Company Polo Shirts for you that will have your custom logo and impress your team and clients.